It was 21 hours by air and several more by a pothole-accented dirt road, but for Katie Campbell, she was in Mecca last February after almost two years of planning and anticipation. 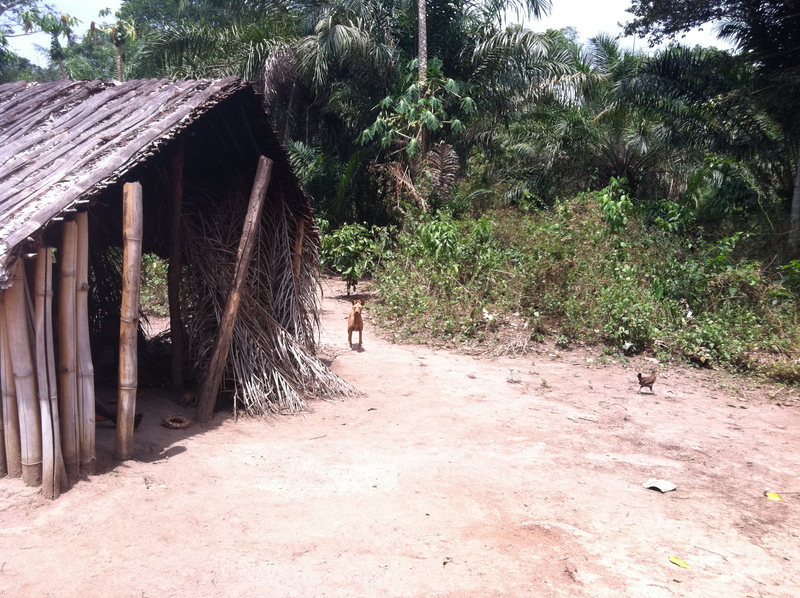 This is an ordinary rural Congolese home with a Basenji left home for the day. Notice that there is no effort to enclose the dog. Mecca is defined as “any place that many people visit or hope to visit.” For a Basenji fancier, Africa is a destination prominent on your bucket list. For Campbell, a Seattle real-estate professional and 20-year Basenji breeder, the Democratic Republic of Congo, the homeland of what is arguably one of the oldest dog breeds in the world, epitomizes the heart and soul of Mecca. The Azande and Mangbetu tribes from the northeastern Congo describe Basenjis in the Lingala language as “dogs from when we were wild” or “dogs from long ago.” Some historians suggest the breed’s origins are Egypt or Asia several thousand years ago. Cave paintings found in Libya dated between 6000 BC and 100 AD have drawings of pariah-type dogs resembling Basenjis in hunting scenes. But modern history shows the dogs have lived in independent packs near African villages, and reproduced without special control from local tribes. And still continue to do so. Like the wolf, the Basenji comes into heat only once a year, and then for only 30 days. It’s most distinguishing feature, however is its inability to bark because of its flat larynx. Campbell’s Basenji Safari stemmed from an invitation in 2009 from Jon Curby and Michael Work, noted breed authorities who had made several earlier trips to Africa, the first in 1987. 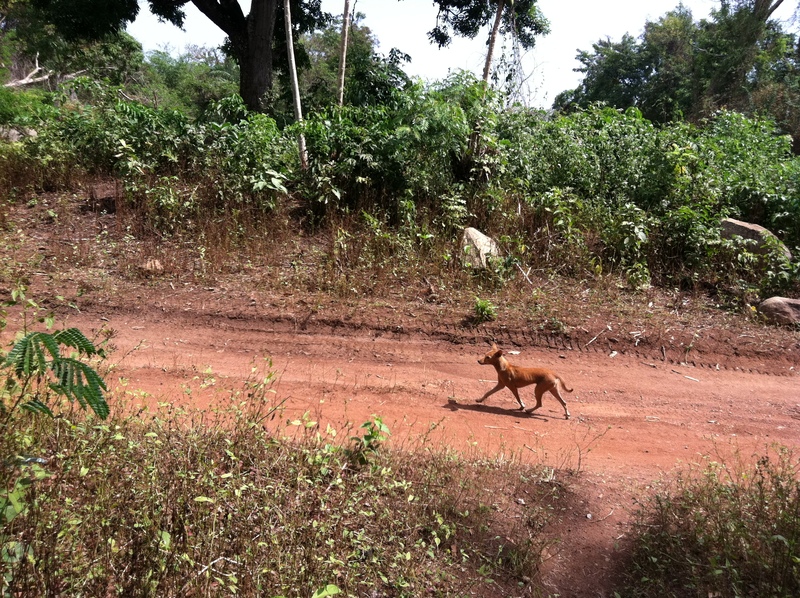 In the Congo, the easiest way for Basenjis to travel is via the dirt road, just like everyone else. The roads are in such poor condition that drivers can't travel more than 10 mph., however. Note the exquisite gait on this dog. Prior to meeting up with seven others in the Basenji gang, Campbell spent a week in Uganda, then flew to Bunia, Democratic Republic of Congo, and then on to Dungu, a village which served as home base for their daily outings in quest of premier Basenji puppies they could purchase from local tribe (Zande) members. The dogs remain close to their wild roots, and are used as hunting partners by their masters, each part of the other’s life. We saw very little petting or emotion toward Basenjis, but there was no question the dogs played a very important role in their owners’ lives, Campbell adds. 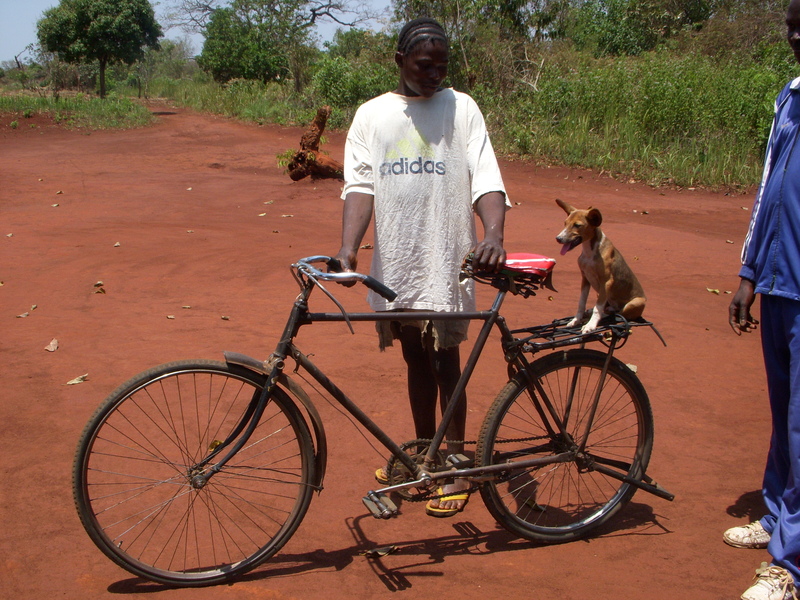 There are no social expectations about maintaining safety of dogs in the Congo. This Basenji is trained to ride on the back of a bicycle clip. Note there is no leash or other restraint. The owners feed their dogs whatever they themselves eat. That diet includes vegetables, chicken, monkey, duiker antelope or bush pig. The dogs supplement that by foraging on their own for small animals and birds. The ancient breed was introduced to England in 1937 at the famed Crufts Dog Show, and reached the U.S. several years later. They were recognized by the American Kennel Club in 1943 and since then have been bred from a limited gene pool, which can be the trigger mechanism for health problems. The Basenji was unable to dodge that bullet, and fell victim to an inheritable disorder called Fanconi syndrome, resulting in widespread kidney failure, by the 1980s. Hence, the initial Curby/Work safari in 1987 and a subsequent one where they bought 13 puppies introduced potential new breeding stock into Western lines. To allow more recently imported dogs to be used for breeding, the AKC in August 2008, at the request of the Basenji Club of America, voted to open the breed stud book to 1-year-old dogs from Africa with no AKC accepted registry. “Due to the changing circumstances in the areas where these dogs thrive, this may be the last opportunity to import the breed from its homeland,” said Sally Wuornos, BCOA president, at the time. The parent club established a 10-step process for owners to apply for foreign dogs’ registry, after which members will vote to ultimately approve the dogs’ entry into the stud book, which will remain open until Dec. 31, 2013. All dogs seen by the safari team had obviously lived in the wild their entire lives. Six select young animals were purchased, with Campbell bringing back three females, two of which she owns. A black-and-white puppy, Makala, she owns in association with a good friend and longtime Basenji breeder, Pat Marshall, of Jasper, Texas, is the first of its color to leave Africa for the western world and their associated registries since 1959. The breed color standard calls for red and white, black and white, brindle and white and tri-color. 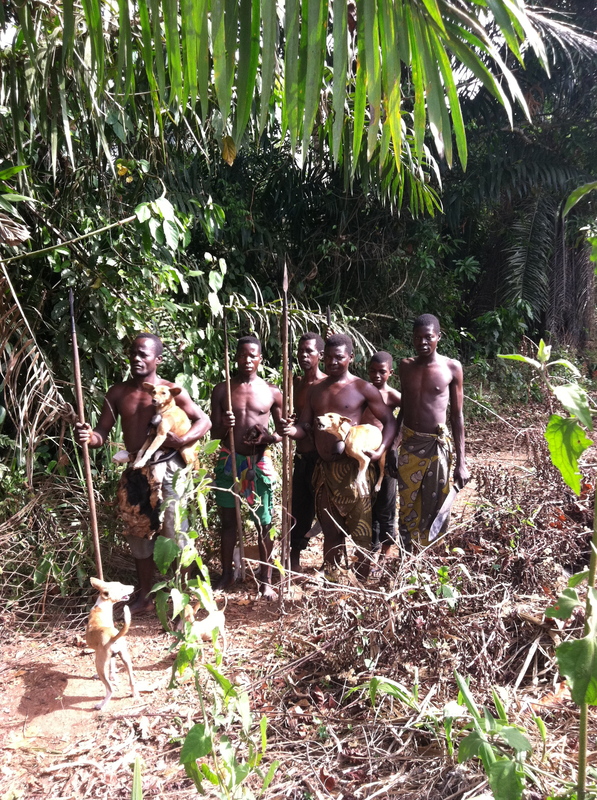 Congolese hunters use their silent Basenjis to assist in capturing bush meat with nets and spears. For the men it means bringing dinner home; to the Basenji,it is just a game that they play with their people friends. The dogs wear "bells" made from the borasus pod of the akua tree, helping the hunters locate their four-legged partners in the deep bush. Marshall has long focused on black-and-white Basenjis. “Not a day goes by when she doesn’t e-mail me or send me a photo of Makala,” laughs Campbell. “All three of these girls share a certain ‘Zen’ that is atypical for domestic Basenjis.” Each will carry an Avongara prefix with its breeding, denoting its direct African origin. Since Naziki is not destined for the show ring and is Campbell’s only resident non AKC champion, the extended socialization, she believes, boosts the dog’s self esteem, much like shows do for her others. Naziki was purchased for $10 (about the price of a chicken) from an individual in a refugee camp inhabited by Sudanese, who traveled south across the border to reach the camp. The facility is about an hour from Dungu, situated near a lavish United Nations headquarters building. One of the identifying marks of discipline on the native Basenjis, when all other methods fail, are bald spots on their skin resulting from boiling water being tossed upon the animal. Naziki’s marker is behind her left ear. In the months Naziki and Makala have been in their U.S. homes, both are much healthier, claims Campbell, chiefly due to medications, vaccines, stable home environment and top-rate nutrition. In more than a month, the confident 10-pound newcomer has segued from a wild animal to a confident household companion that trots down the city sidewalk on a loosely held leash with every bit the bravado of a top show dog that quickly owns the crowd. “To me, Naziki is truly one in a million,” concludes Campbell.